The Lamborghini Aventador LP 750-4 will make its UK debut by tearing up the hill at the 2015 Goodwood Festival of Speed on 25-28 June. The quickest production Lamborghini ever, the Aventador Superveloce has 750PS running from a naturally aspirated V12 engine to all four wheels. 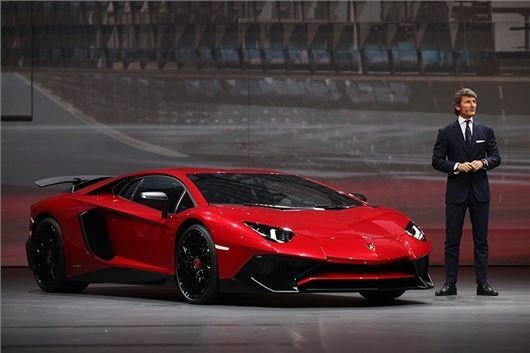 That explains the ‘750-4’ part of the name, while the Superveloce bit signifies a 50kg weight reduction over the fatty standard Aventador, mostly achieved through liberal use of carbon fibre. The result is a 0-62mph time of 2.8 seconds and a 217mph top speed, and the sort of theatre that makes Lamborghini’s other pair of Goodwood 2015 entries – Huracan 610-4 and Huracan 620-2 Super Trofeo – look rather tame. The Huracan, Lamborghini’s Gallardo replacement, was launched in 2013 and comes with a 5.2-litre V10, loosely related to the engine in the Audi R8 V10 – that’s Volkswagen Group synergy for you. It does the 0-62mph sprint in just 3.2 seconds, although you won’t get the chance to see that in Goodwood because the car is being used as a display opposite Goodwood house. Finally, Lamborghini enthusiasts will get the chance to see the Super Trofeo version – the racing version, that is – of the Huracan at Goodwood. The 620PS, rear-wheel drive version of Lamborghini’s cheapest car has spent most of this year racing in various heats of the Blancpain Super Trofeo in Europe, America and Asia.